Moltres in game: 1,387 Who? Important notice! 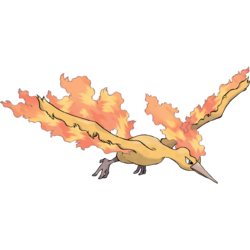 Pokemon Moltres is a fictional character of humans. 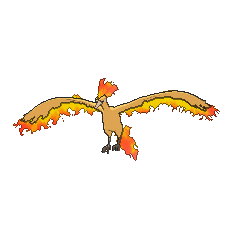 Moltres sheds embers with every flap of its wings, composing a brilliant flash of flames. By dipping itself into the magma of an active volcano, this Pokémon can heal itself. It migrates to the south with the coming of spring, and is said to bring an early springtime to cold lands. Moltres is rarely seen by Trainers. Moltres made its first true appearance in The Power of One. Lawrence III wanted to capture the three Legendary birds as well as their master Lugia. 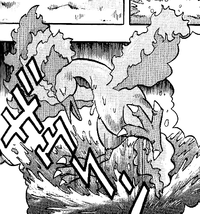 A Moltres made its debut in All Fired Up, though engulfed in flames, where it defeated Team Rocket. It reappeared in a flashback in Round One - Begin! and in another flashback in Friends to the End. A Moltres appeared in The Search for the Legend where Butch and Cassidy attempted to capture it. A Moltres appeared in the Hoopa's Surprise Ring Adventures short Heated Battle. A Moltres appeared in A Legendary Photo Op!, resting in the crater of Mt. Molteau. Ash and his friends joined Trevor, who was looking to photograph the Legendary bird, but after being attacked by Team Rocket, Moltres assumed Ash and the others were allied with the trio, and attacked them. After watching the recklessly selfless actions of the newly evolved Talonflame and its Trainer, however, Moltres realized that Ash's group was not with Team Rocket, and left them in peace. 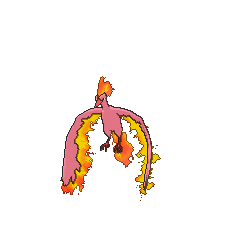 A rough image of Moltres was first seen etched in a stone hanging in the Viridian Pokémon Center in Pokémon Emergency. Additionally it was mentioned in The Fortune Hunters where James mistakenly believed that it was his "Inner Pokémon" and dressed up in a Moltres costume. James also wore a similar Moltres costume in The Dunsparce Deception. A Moltres appeared in An EGG-sighting Adventure! as part of Team Rocket's fantasy. A Moltres made a cameo in the intro of Lucario and the Mystery of Mew, The Rise of Darkrai, Arceus and the Jewel of Life and Zoroark: Master of Illusions. SS018 Moltres Ritchie's Pokédex Moltres, a one-of-a-kind Legendary Flame Pokémon. So powerful, its fire dust can bring early spring to wintery land. Moltres made a cameo appearance in the Saffron City stage. Very rarely, it will fly by in the background. Known as the legendary bird of fire. Every flap of its wings composes a dazzling flash of flames. 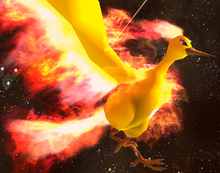 It is said to be the legendary bird Pokémon of fire. Every flap of its wings composes a dazzling flare of flames. It produces flames and composes pillars of fire to attack. 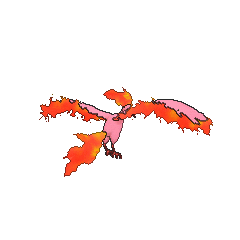 In Generation I, Moltres is the only member of the Legendary Birds to not be found in an optional dungeon. The Kanto Power Plant can be ignored entirely and the Seafoam Islands may be skipped by surfing south from Pallet Town, but Victory Road must be traversed to reach the Indigo Plateau (although the area where Moltres is found is optional). In the remakes FireRed and LeafGreen, Moltres was relocated to Mt. Ember on the Sevii Islands, which the player never needs to visit. 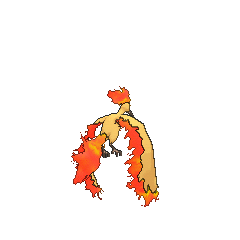 In Pokémon HeartGold and SoulSilver, Moltres is found in Mt. Silver, making it the only Legendary bird not to be found near its location in Pokémon Red and Blue in these games. 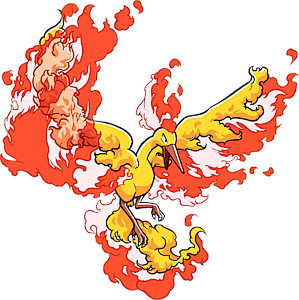 Moltres is the only member of its trio that can't have super effective STAB against a Pokémon of its own type. Both Zapdos's Electric moves and Articuno's Ice moves are super effective against the Flying Pokémon. Moltres is the only one of the three Legendary birds to not appear in the original opening of the English dub. Moltres is a combination of molten and tres (Spanish for three, indicating that it is the third in the series of Kanto Legendary birds). It may also derive from molt.